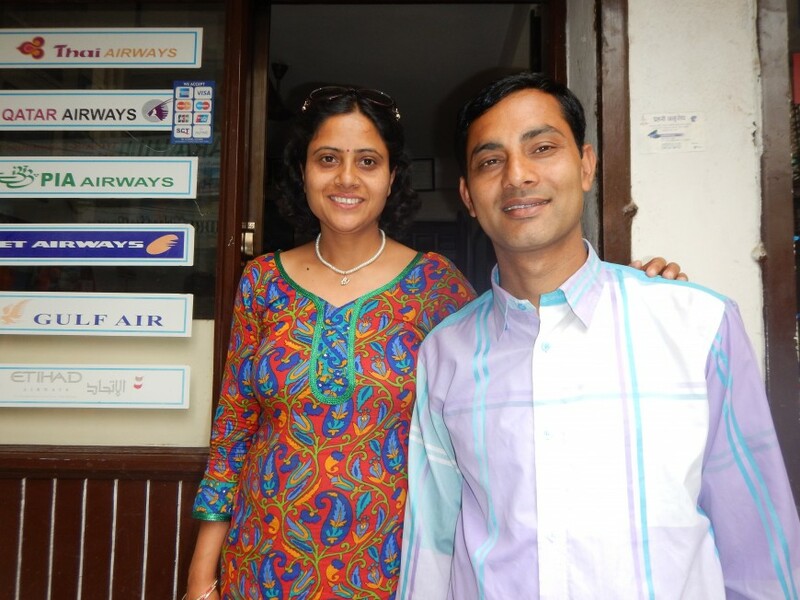 I met my good friend Ram and his wife Nirmala a few days ago. Ram had just arrived back in Kathmandu from his village in Dhading where he had been since the earthquake, organizing aid work and helping 3,500 people in his village and surrounding area. In Ram’s village of Jyamrung, all of the houses, the school and health station were totally damaged on April 25th. Dhading is one of the 14 regions here in Nepal that has been very affected by the damages from the earthquake. Ram lives in Kathmandu with his wife and two sons, where he runs a trekking agency. He grew up under simple conditions in a farm in Jyamrung. Ram once told me that he got his first pair of shoes when he was eleven. It is hard work that has brought him to where he is today as a successful social entrepreneur. Ram is involved in social projects in Dhading and has contributed to the development of 25 schools and an untold number of health stations. I was in his office before the earthquake discussing a trek I am arranging in Ganesh Himal next spring through Nepaltur.no. We were talking about the trek and some of the villages along the way, and Ram told me that he had taken over and financed the operation of a health clinic from the government in a remote village in a very poor area. I know that Ram’s heart is deeply involved in the social work that he does. He gets a special shine in his eyes when he is talking about them. Ram has helped people less fortunate than himself for years, and he will not let the villagers down now when they need help the most. In this first phase of aid work from the recent earthquake, which has consisted of getting families temporary homes in tents and food, Ram has supported 3,500 people for the total cost of $20,000 US dollars. That’s an average cost of $5.70 US dollar per person! The money Ram has used has been partly through his own funds; however, a substantial amount of the money came from donations through his international contacts. Ram is doing a tremendous job for his country and home region. Nepal has many people like Ram who have social concerns for local communities where they are from. They represent a cornerstone in the work that has been done in the past, is being done now and will have to be done in the future in order to rebuild there homeland. When the large international aid organizations have moved on to the next catastrophe, it will be people like Ram who will be here and who will do as they have always done. Please help to support people like Ram — the cornerstones of their country — in the rebuilding work that lies ahead for Nepal. – Donate money to the Nepal Earthquake Relief.